VMware DRS dynamically balances computing capacity across a collection of hardware resources aggregated into logical resource pools, continuously monitoring utilization across resource pools and intelligently allocating available resources among the virtual machines based on pre-defined rules that reflect business needs and changing priorities. When a virtual machine experiences an increased load, VMware DRS automatically allocates additional resources by redistributing virtual machines among the physical servers in the resource pool. 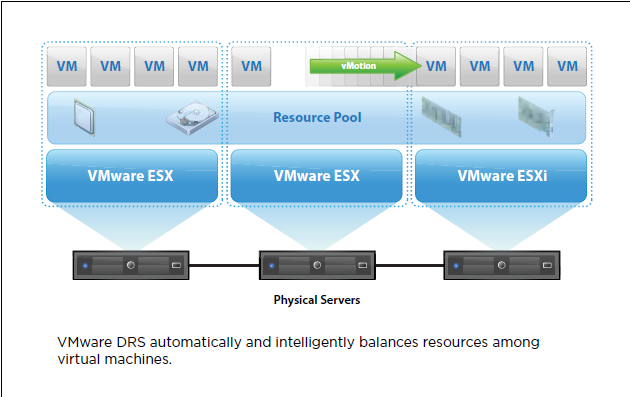 How Does VMware DRS Work? VMware® DRS aggregates computing capacity across a collection of servers into logical resource pools and intelligently allocates available resources among the virtual machines based on pre-defined rules that reflect business needs and changing priorities. VMware DRS allows users to define the rules and policies that decide how virtual machines share resources and how these resources are prioritized among multiple virtual machines. When a virtual machine experiences increased load, VMware DRS first evaluates its priority against the established resource allocation rules and policies, and if justified, allocates additional resources. Resources are allocated to the virtual machine by either migrating it to another server with more available resources or by making more “space” for it on the same server by migrating other virtual machines to different servers. The live migration of virtual machines to different physical servers is executed completely transparent to end-users through VMware VMotion™. VMware DRS can be configured to operate in either automatic or manual mode. In automatic mode, VMware DRS determines the best possible distribution of virtual machines among different physical servers and automatically migrates virtual machines to the most appropriate physical servers. In manual mode, VMware DRS provides a recommendation for optimal placement of virtual machines, and leaves it to the system administrator to decide whether to make the change. Flexible hierarchical organization of resource pools allows administrators to match available IT resources to the needs of the business organization. Individual business units can receive dedicated IT resources while still benefiting from the efficiency of resource pooling. Robust access privileges make it possible to delegate routine infrastructure tasks for a business unit resource pool to a business unit system administrator. How Does VMware DPM Work? 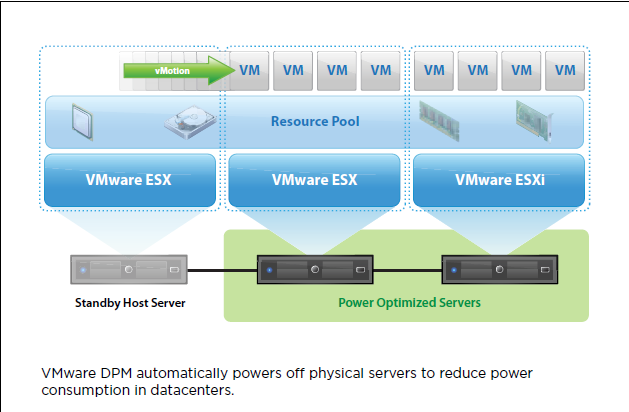 VMware DPM is a component of VMware DRS that makes recommendations or decisions to power off or power on hosts to save energy. These recommendations are based on a comparison of the available capacity in a DRS cluster against resource requirements of virtual machines plus some administrator defined buffer capacity requirements. If DPM detects there are too many hosts powered on, it will consolidate virtual machines onto fewer hosts and power off the remaining. VMware DPM will bring powered off hosts online once again to meet virtual machine requirements either at a pre-defined time or when it senses virtual machine requirements increasing.